Swati Bhadauria has done her schooling from Little Flower School, Gorakhpur and after that she had done B.Tech (Electronics and Communication). She had worked with Reserve Bank of India for 6 months while preparing for her IAS exam. 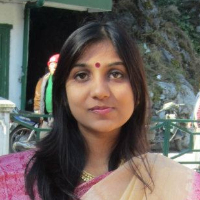 In 2012, She joined IAS in Chattisgarh cadre and got transfer in Uttarakhand cadre in 2015. She had worked as SDM for Mussorie and Dehradun also and currently she is working as Additional Secretary, MSME department plus Additional CEO in Khadi and Village Industries Board, Uttarakhand. Indian Administrative Service selection is through the UPSC exam and it is common for 24 variety of services. IAS is topmost priorities of people appearing the exam. It is a generalist service and offers a lot of exposure and a very diverse job profile. It includes SDM (Sub Distric Magistrate), DM (District Magistrate) and a varied range of job profiles. IAS plays a key role in administration and policy making. "I have done my schooling from Little Flower School, Gorakhpur and after that I did B.Tech (Electronics and Communication). I have worked with Reserve Bank of India for 6 months while preparing for the IAS exam. In 2012, I joined IAS in Chattisgarh cadre and got transfer in Uttarakhand in 2015. I have worked as SDM for Mussorie and Dehradun both. Currently working as Additional Secretary, MSME department plus Additional CEO in Khadi and Village Industries Board, Uttarakhand."